Digital Urban: Tool or Toy? 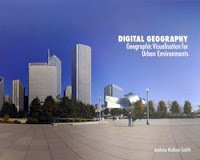 Virtual Globes in Landscape Planning? Tool or Toy? 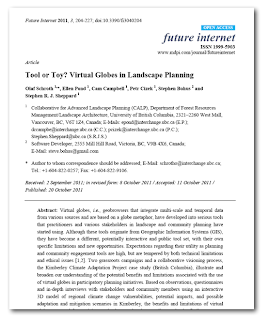 Virtual Globes in Landscape Planning? Future Internet has published - Schroth, O.; Pond, E.; Campbell, C.; Cizek, P.; Bohus, S.; Sheppard, S.R.J. Tool or Toy? Virtual Globes in Landscape Planning. Future Internet 2011, 3, 204-227. Virtual globes, i.e., geobrowsers that integrate multi-scale and temporal data from various sources and are based on a globe metaphor, have developed into serious tools that practitioners and various stakeholders in landscape and community planning have started using. Although these tools originate from Geographic Information Systems (GIS), they have become a different, potentially interactive and public tool set, with their own specific limitations and new opportunities. 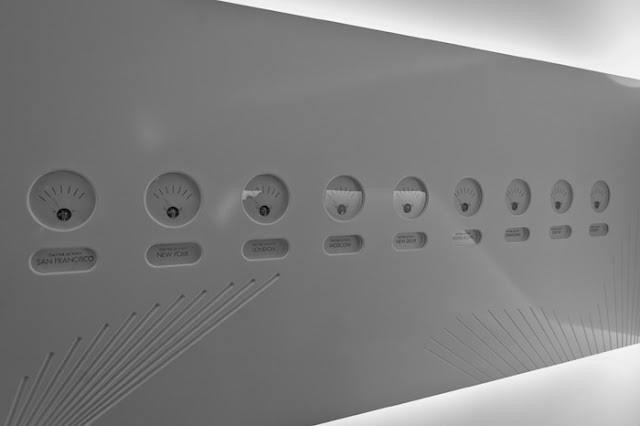 Expectations regarding their utility as planning and community engagement tools are high, but are tempered by both technical limitations and ethical issues [1,2]. Two grassroots campaigns and a collaborative visioning process, the Kimberley Climate Adaptation Project case study (British Columbia), illustrate and broaden our understanding of the potential benefits and limitations associated with the use of virtual globes in participatory planning initiatives. Based on observations, questionnaires and in-depth interviews with stakeholders and community members using an interactive 3D model of regional climate change vulnerabilities, potential impacts, and possible adaptation and mitigation scenarios in Kimberley, the benefits and limitations of virtual globes as a tool for participatory landscape planning are discussed. The findings suggest that virtual globes can facilitate access to geospatial information, raise awareness, and provide a more representative virtual landscape than static visualizations. However, landscape is not equally representative at all scales, and not all types of users seem to benefit equally from the tool. The risks of misinterpretation can be managed by integrating the application and interpretation of virtual globes into face-to-face planning processes. Principal Research Scientist and Research Manager, Spatial Information Sciences, Department of Primary Industries Victoria, Australia and Dr. Arzu Coltekin,Department of Geography, University of Zurich, Winterthurerstrasse 190, 80750 Zürich, Switzerland.